Facebook has added a hot of new features for its Messenger app including native support for looping Boomerang videos, there’s also a Selfie mode that automatically blurs out the background, and an augmented reality feature that lets you place Messenger’s stickers in your photos and videos. The new selfie mode to the Messager makes the total camera modes to five including normal, video, text, boomerang, and selfie. 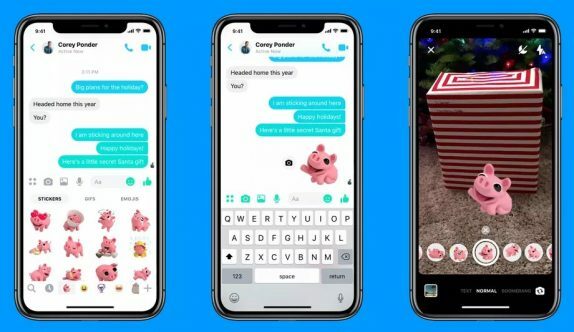 Facebook Messenger already includes Augmented reality effects and the new AR stickers are the company’s attempt to pair these effects with the same stickers that can currently be sent through standard text chats. By pressing the camera icon next to a sticker, you can now add that sticker as an augmented reality object. Facebook says that Messenger’s new features will become available to a majority of users globally starting today, and will be available in both Messenger’s redesigned app and its older version.